A seemingly innocuous choice leads to wildly divergent potential futures in a genre-busting departure for a lauded fantasy author (Bitterblue, 2012, etc.). Still grieving for the aunt who raised her, Jane has dropped out of college and feels left at loose ends. 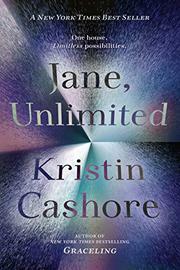 At the invitation of a wealthy sort-of friend, she visits the family’s crazy-quilt mansion on their private island only to find it overstocked with rich eccentrics, mysterious servants, fabulous art, dangerous secrets, potential lovers, and infinite possibilities. After a contrived setup freely borrowed from the classics of gothic fiction, the storyline splits into five distinct narratives, each employing the style and conventions of a different genre (mystery, thriller, horror, science fiction, and fantasy), each intersecting and commenting upon the others, and each with a different (not always pleasant) conclusion. This can all manifest as a bit too clever, and the bewildering abundance of supporting characters from every class, ethnicity, and sexual orientation sometimes reads more like bundles of quirks than fully realized persons. Still, an understated romance (plus a perfectly adorable basset hound) helps unify the various scenarios, and the whole is grounded by the personality of the bisexual title character—the only one explicitly ambiguous in race—with her honest kindness, blunt humor, nerdy creativity, and rock-solid integrity.